This is such a brilliant idea I want to steal it — would you be OK with that? My response: Are you kidding? I would be delighted if other science fiction and fantasy writers also offered up some tasty piece of their work life as an enticement for people to donate to the John M. Ford Book Endowment. I think it’s a fine way to make sure his name and legacy live on in a vital and useful way. I want to be very careful about overstating my relationship either to Mr. Ford or to this endowment — I know Mike Ford mostly through the quality of his friends and the quality of his writing, both of which are ridiculously high, and my only involvement with the endowment in his name is that I hope to be able to direct a nice chunk of money its way. That said, literacy is important to me, and the ability to help direct money into an endownment that will directly and perpetually buy books seems like the sort of thing I can get behind, and something I hope other writers could get behind as well. So, other science fiction/fantasy writers: Yes, please, steal this idea. Offer up something others that your fans would kill to get, and make them pay for it, and then give all the money to the John M. Ford Book Endowment, and encourage your fans to pitch in a few bucks to the endowment even if they don’t win the auction. Because libraries rock, literacy beats the alternative, and the science fiction and fantasy community could use an excellent philanthropical hobby. If authors do decide to create auctions to benefit the John M. Ford Book Endowment, I’ll be happy to link to them here. Just drop me an e-mail with a link to let me know. Maybe that will help. It would be nice, in any event. Update: On that note, Jo Walton has her enticements to donate up on her LiveJournal. Depending how much you donate, you can get unpublished stories, get yourself tuckerized or even (!) get an original poem. And she has books to auction off as well. Excellent. * Oh, dear. You know it’s a bad scandal for the Republicans when the Washington Times is calling for Denny Hastert’s resignation. It also suggests that Hastert’s Colonel Clink Sergeant Schultz defense of clasping his hands to his head and declaiming “I know nothink!” isn’t going to be as effective as he may have hoped it was going to be. Along the same line, however, this tantalizing line from Brian Ross about how other former pages are coming forward with dirt on other congressional folks has some lefties just about exploding with joy; I think it’s sweet how these folks seem to be under the impression that only conservatives can get hopped up on thoughts of young and tender teenage flesh. Got news for you, folks: If indeed there are more congresscritters mashing out lust notes in IM form to their teenage pages, the chances that all of them are going to be on the same side of the aisle quickly approaches zero. Creeps come in all political orientations. What’s relevant in this particular case, to my mind, is how long leadership knew Foley was crushing on teen pages, and why he was allowed to continue co-chairing a caucus charged with protecting kids and teens when it was clear his interest in teens was not entirely one of compassion. * Charlie Stross is talking about book covers, and how much input an author has, by noting his own involvement in his various book covers with various publishers. My experience on this is close to Charlie’s: With my Tor books I was basically presented with artwork and allowed to comment and make suggestions, whereas with my Subterranean Books I had considerable more leeway (as, interestingly enough, I did with my Rough Guide to the Universe book, in which the picture I suggested for the cover ended up there). I feel fortunate that I’ve been pleased with nearly all the covers of all my books, and those ones I wasn’t thrilled about are an object example of why author’s shouldn’t necessarily drive the art design: I don’t think the covers of the Book of the Dumb books are brilliant, personally, but as those books are my bestsellers so far, clearly the covers speak to their market segment. So there is that. I don’t mind being wrong in this case, incidentally, because it’s worked out well for me. But I am glad my input does seem to matter to my other publishers. * The auction for The Last Colony seems to be coming along swimmingly; at the moment I’m writing this, it’s up to $350, which thrills me to no end. Thanks to everyone who has bid so far. You’ll notice that I put a line about the auction at the top of this entry; I’ll probably cut and paste that line into each new entry (taking it off the old entries as I do so) until the auction has run its course. I want to keep the auctino top of mind, but I’m going to try not to be obnoxious about it, especially as the bids are already at a level I consider a success. * Do bloggers write better than high school students? Chad Orzel and Dave Munger asked bloggers to take the same writing test teenagers take on the newly updated SATs, and see how they fared. The results are fairly gruesome. I didn’t take up the challenge myself; after presuming to give teenagers writing advice, I would dread discovering I hosed the SAT essay challenge. I’d have to go back to high school and start all over. And that’s just wrong. The Short Version: I am auctioning ONE bound copy of the manuscript of my upcoming novel The Last Colony to benefit the John M. Ford Book Endowment, for the Minneapolis Public Library. This is an EXTREMELY RARE version of the manuscript, one of only four, and the ONLY way to read the novel prior to its May 2007 release. Opening bid is $50; bid increments of no less than $1, whole dollar increments only. Auction closes 11:59:59 pm eastern, Monday October 9th. Please read the long version for more details and on how to bid. I read in Elise Matthesen’s LiveJournal today that the Friends of the Minneapolis Public Library have inaugurated a John M. Ford Book Endowment, to allow Mike Ford’s memory to live on through the acquisition of books for the public’s enjoyment. As a writer and as a fan of libraries, this is a thought that I can get behind, and I thought about what I could do to help the endowment along. Well, as it happens, today I received four bound copies of my manuscript for The Last Colony, the third and (for now, at least) final novel in the “Old Man” series. The copies were printed via Lulu, the print-on-demand house, and look and feel like your standard trade paperbacks. One copy is for my own reference, one copy is for my wife, and I printed two additional copies as well. After receiving permission from my editor, I am now offering one of these copies for auction, to benefit the John M. Ford Book Endowment. Since this auction may bring new folks to my site, allow me to introduce myself and The Last Colony to you. 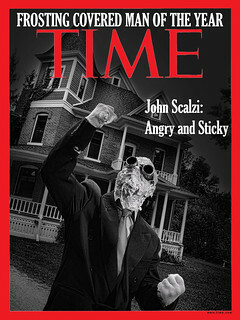 I’m John Scalzi and I write science fiction. I’m the 2006 winner of the John W. Campbell Award for Best New Writer. My first science fiction novel, Old Man’s War, was nominated for the Hugo award. 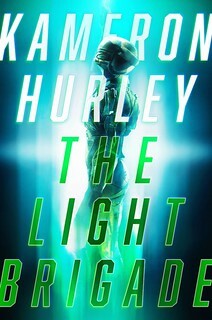 Its sequel The Ghost Brigades is currently available in hardcover. 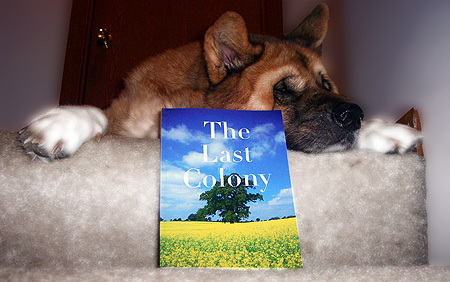 The Last Colony is the third book in this series. What is The Last Colony About? Former soldier John Perry has found peace in a violent universe, living a quiet life with his wife Jane on one of humanity’s many colonies. It’s a good life, and yet there’s something… missing. When John and Jane are asked to lead a new colony world, he jumps at the chance to the explore the universe once more. But Perry quickly finds out that nothing is what it seems. He and his new colony are pawns in an interstellar game of diplomacy and war, between humanity’s Colonial Union and a new, seemingly unstoppable alien alliance that has ordered an end to all human colonization. As this grand gambit rages above, on the ground Perry struggles to keep his colonists alive in the face of threats both alien and familiar, on a planet that keeps its own fatal secrets. For the survival of his colony, Perry must unravel the web of lies, half-truths and deception spun around him and uncover the shocking true purpose of his colony — and fight to prevent a war that not only threatens to engulf his new home, but promises the destruction of the Colonial Union. There are few options, and no margin for error, for Perry to keep his colony from becoming the last colony of the human race. 1. It’s the only way you’ll be able to read this novel prior to its release in May of 2007 (unless you’re a reviewer, but even then you’ll only get it in April 2007. It’s still a long wait). As of this writing, the number of people who have read the book can be counted on my fingers; you’ll be in exclusive company. 2. This is an extremely rare edition of the book — only four copies of this edition exist, or ever will exist — I deleted the template for the book after I ordered these copies. This makes this version of the novel the ultimate in collector’s editions. 3. I will of course sign and (if desired) personalize the novel for you, adding to its collector’s value. 4. You’ll be helping to advance the cause of literacy: Every penny of your bid will go directly to the John M. Ford Book Endowment, benefitting the Minneapolis Public Library. There it will work in perpetuity to purchase books for general use. 5. You’ll be honoring the memory of a good man and a damn fine writer. At $500, I’ll put in a signed Advance Reader Copy of Agent to the Stars. At $1,000, a signed ARC of The Ghost Brigades. At $2,000, a signed copy of Old Man’s War. At $3,000, I’ll make you a character in an upcoming book (note: I may kill you off. Hey, it happens). And at $5,000, I’ll write you your own short story. Because, damn, if you’re paying $5K, you deserve it. So the more you bid, the more you’ll get. And remember, all of it goes to the John M. Ford Book Endowment. Easy: Place your bid in the comment thread attached to this entry. Do this by entering the dollar amount of your bid in the comment field. US dollar amounts only. Please put your bid amount at the top of your comment, away from any additional comment, so other bidders may easily see the amount of the bid. You MUST input your real name and a valid e-mail address on their respective lines in the comment form. This will allow me to contact you if I have to, and also help me make sure bids are valid (do not put your e-mail in the body of your message). Bids without this information are not valid. Please do not use this comment thread for anything other than making bids; it’ll get cluttered. I’ll be deleting non-bid messages. If you want to make a non-bid comment on this entry, use this entry for discussion and questions. Bidding starts at $50. Which is to say, I’m not parting company with this copy for any less. Additional bids must increase the previous bid by no less than $1. No penny ante crap, please. Additionally, all bids must be in whole dollar amounts: $2, for example, not $1.99 (or $1.50, or $1.25, or whatever). This will keep the math relatively simple. To avoid pranking, the maximum bid increase is $20 a turn. This is to say that if the previous bid is $60, your bid can raise the total bid to no more than $80 ($60 + $20). Once someone else has bid more, you may of course bid again. You must wait until someone else has bid in order to bid again; no sequential bids. If the auction exceeds $1000, the maximum bid increase will bump up to $50 a turn. Also, I’ll be very happy. In the case where two people enter the same bid amount, the earliest bid is the valid one. As the second bid is invalid, that bidder may immediately bid again if he or she chooses. The auction begins the moment this entry is posted; it ends at 11:59:59 pm Eastern, Monday, October 9, 2006. At that point the highest bidder will be declared the winner. Bids posted after that time will not be considered valid. I am the timekeeper, which is to say my clock is the legitimate clock for this auction. I reserve the right to declare a bid void, and remove it from the comment queue, if in my opinion it is not a legitimate bid; declaring a bid void may also declare bids subsequent to it void, based on my discretion (if your bid has been declared void and removed because of this, feel free to resubmit your bid). I reserve the right to ban specific bidders if I feel they are bidding in bad faith. Likewise, I reserve the right to cancel the auction. If I cancel the auction, I will contribute no less than $50 (i.e., the opening bid price) to the John M. Ford Book Endowment. So matter what happens, the Endowment’s getting paid. Please note that I fully expect that people will indeed bid fairly and honestly; I’m just trying to lay down ground rules. Having said that, please don’t bid if you don’t have the money or don’t have any intention of honoring your bid at the end of the auction. Save us all the aggravation, please. I’ll send you an e-mail confirming your win. I’ll need a reply in no more than 24 hours after I sent you the e-mail, confirming that you intend to honor your bid, and an address I can mail the book to. Once I get that, you’ll have the option of either paying your bid amount to me through Paypal, or mailing me a check/money order. If you send your amount via PayPal, I’ll stuff the book into an envelope the instant I get the money. If you mail a check/money order, you’ll need to wait for the payment to clear. If I don’t hear back from you in 24 hours after I’ve e-mailed you, I’ll make the executive decision your bid wasn’t serious and I’ll move down the list to the next highest bidder. Sorry. Note my decisions are final. Again, if you have any questions or comments, don’t put them in this comment thread, put them in this one. This thread is for bids only. Incidentally, if you want to donate to the John M. Ford Book Endowment without making a bid here — and of course I encourage all of you to do so — go here to do it. This is the place where comment and discussion about the Last Colony auction goes. What say you?